The family-friendly city of Katy packs its small-town charm across three counties and four zip codes. Katy covers Harris, Fort Bend, and Waller counties. 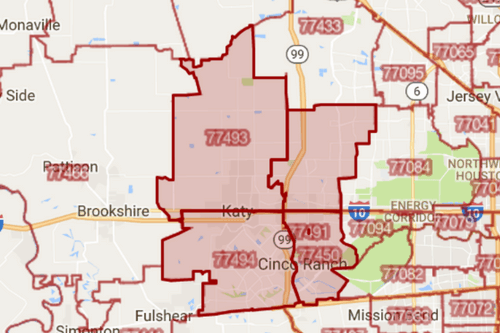 The Katy zip codes are: 77449, 77450, 77493, and 77494. There are two zip codes, 77491 and 77492, that are PO Box zip codes only. Katy is in Houston’s Outer Loop, and is about 22 miles from Downtown Houston. Check out some insights on each of the Katy zip codes below. While the city of Katy maintains the small town feel throughout its multiple zip codes, there are substantial differences between the different zip code areas of Katy. In this article we break down the differences among eacharea and pull out their unique traits points of interest as you consider a move in the area of Katy TX. This is a quiet, rural part of Katy. It’s a young area with lots of families, few seniors, and many singles. But don’t let its tranquil neighborhoods fool you — it’s far from boring. With the Grand Parkway recently open on this side of Interstate 10, the area is exploding. This zip is home to the new Katy Asian Town, the recently remodeled Cinemark 19, University of Houston-Victoria, Memorial-Hermann Katy Hospital, and the Grand Parkway Park & Ride Metro. Desirable neighborhoods include Williamsburg Settlement, Lakes of Bridgewater, and Waterstone. This part of Katy is wealthy and full of married couples and families. You’ll find established neighborhoods like well-known Cinco Ranch, Kelliwood, and Nottingham Country. 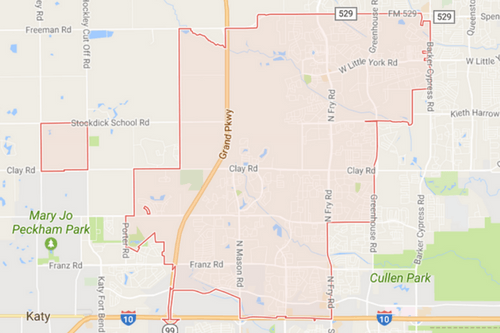 Many consider this zip code to be the heart of Katy. Offices, restaurants, and shopping centers abound. Other notable landmarks are Alamo Drafthouse, Maud Marks Public Library, the Great Southwest Equestrian Center, and University of Houston-West Houston Institute. This is an educated population, with only 4% having less than a high school degree. The 77493 zip code is a small area that’s home to many children under 18. Expect to find new developments everywhere you look, as well as established areas like Old Town Katy. Ventana Lakes, Fawnlake, and Heritage Meadows are popular neighborhoods in this zip. Here you’ll find some of the most charming and nostalgic establishments in the city, such as Multiplicity, Junk Street Market, and Kay’s Tea Parlour. Families will love spending an afternoon at the historic Katy Heritage Park, or attending a game at the mammoth Legacy Stadium. The male-female ratio here is a nearly perfect 50/50 split. Almost 90% of residents drive to work and have a travel time of 10-29 minutes. This is another wealthy part of town, home to a majority of married couples. Some neighborhoods are established, like Falcon Landing and Grayson Lakes. Others are up-and-coming — check out Firethorne and Tamarron, among many others. The sprawling area reflects the difference in neighborhoods. You’ll see everything from sleepy, tree-lined streets to new construction in every direction. 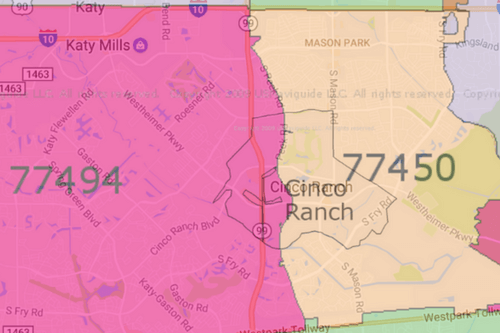 Katy Mills is located in this zip code, as is Typhoon Texas, LaCenterra, and Cinco Ranch Library. The vast majority of homes in this zip were built in the 2000s. Only 13% of households are occupied by renters. 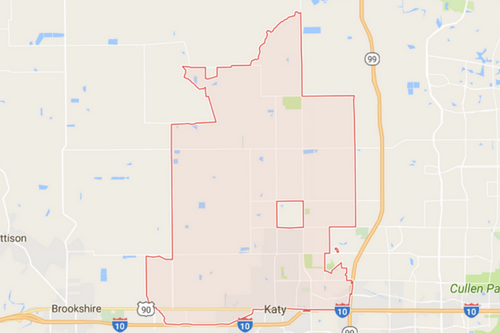 To keep things simple, we’ve put together a list of mapped zip codes in Katy, TX. You will find maps for all different parts of town. Ameritex has vast experience moving customers from one part of Katy to another. Moving is something we’re deeply passionate about — we love what we do, and we love our clients. We’re proud to be your top choice for a Stress-Free Move. Plus, our moving specialists know all about the different zip codes in Katy, TX. Need assistance with your move? Call Ameritex Movers today for a free moving estimate.